Since we left Australia our wildlife encounters had been few and far between, Borneo was our opportunity to make up for that. We had intentionally saved it until last and had high expectations on the wildlife front! 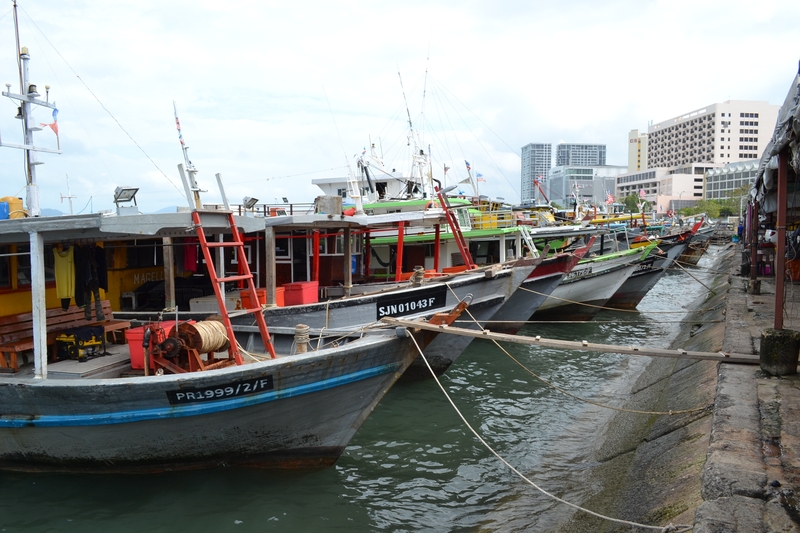 We began our adventure with four nights in Kuching in the state of Sarawak. It was raining on and off for the first two days but luck was on our side and we managed to avoid being caught in a downpour. We visited the Sarawak Cultural Village which introduced us to even more layers of Malaysian diversity. 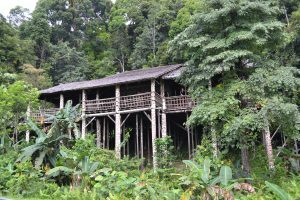 There are many distinct indigenous tribes in Borneo, and the village had examples of the traditional longhouses and way of life of some of them including the Iban and Dyak. There were even skulls hanging from the ceiling of one of the headhunter tribes! The girls enjoyed the show of various dances and an Iban hunter popping balloons with blow darts from across the theatre. 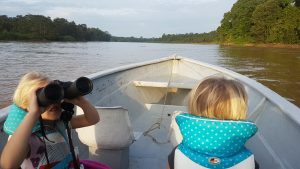 The following day we visited Semenggoh Nature Reserve with high hopes of catching a glimpse of an orangutan. The centre rescues and rehabilitates orangutans before releasing them back into the wild, but continues to provide two feedings per day. The animals are free to roam so sightings are not guaranteed, particularly in fruiting season where food is in abundance. However, we were lucky and I can’t describe the feelings as we watched the first branches moving and an orangutan appearing as if from nowhere. He seemed to know we were watching as he performed somersaults or hung upside down to grab more bananas. When he was done he disappeared just as stealthily as he had appeared. We moved down to a second feeding platform where another young male showed up, and very energetically grabbed as much food as he could carry and swung away again. Amazing! Our luck ran out the following day when our Irrawaddy dolphin spotting trip was cancelled due to torrential rain. It gave us time to explore the ‘cat city’ in between downpours. There are a few theories as to why Kuching is referred to as the city of cats but whatever the reason, there are numerous statues and murals of cats, a cat museum, cat souvenirs and a ‘Cats FM’ local radio station. Cats aside, it was a walkable, colourful city even in the rain with some interesting buildings, narrow streets of shop-houses and a good bazaar and market along the riverfront. It gave us another chance to sample new foods – we discovered melt-in-the-mouth roti in Little India and ordered far too much food in a fresh seafood hawker centre, unusually located on the top of a multi storey car park. We flew from Kuching to Kota Kinabalu (or KK as it’s known to the locals), in the state of Sabah. We hadn’t done much research on KK, it was really just a stopover between flights. We stayed two nights in a family room in a cheap but clean hostel. We were happy to see it had stopped raining and seized the opportunity to do a self guided walking tour of some of the city highlights. Once a colonial town, all that is left is a clock tower and the old post office. The city was flattened during WW2 and the concrete buildings they have built since are less than attractive. However, what it lacks in architecture they make up for in their use of colour! We really liked the city, particularly the huge waterfront market which was a pleasure to wander around and we returned in the evening for a delicious dinner in the buzzing night market. We flew from KK to Sandakan and spent three nights at Paganakan Dii tropical retreat, on the edge of the jungle in Sepilok. From there we visited the Labuk Bay Proboscis Monkey Sanctuary. 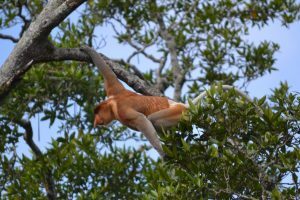 This large-nosed monkey is only found in Borneo and has been on our must-see list since the girls learnt about it in their favourite wildlife cartoon (Wild Kratts). The animals are wild but the sanctuary feeds them to encourage them to visit. We saw two groups of around 25 monkeys and had such a giggle at the seemingly uncoordinated way they leap from tree to tree, their noses, the funny noises they make with them, and their pot-bellies. They were comically human-like as they slouched around munching their breakfast. We just made it through the canopy walk at the rainforest discovery centre before the rain came again that afternoon. The following day we visited the Sepilok Orangutan Rehabilitation Centre and the Bornean Sun Bear Conservation Centre next to it. 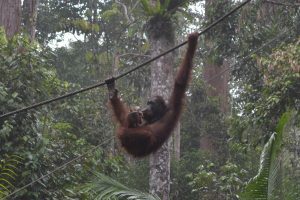 We spent the whole day between the two so we were lucky to have a few close encounters with orangutans. 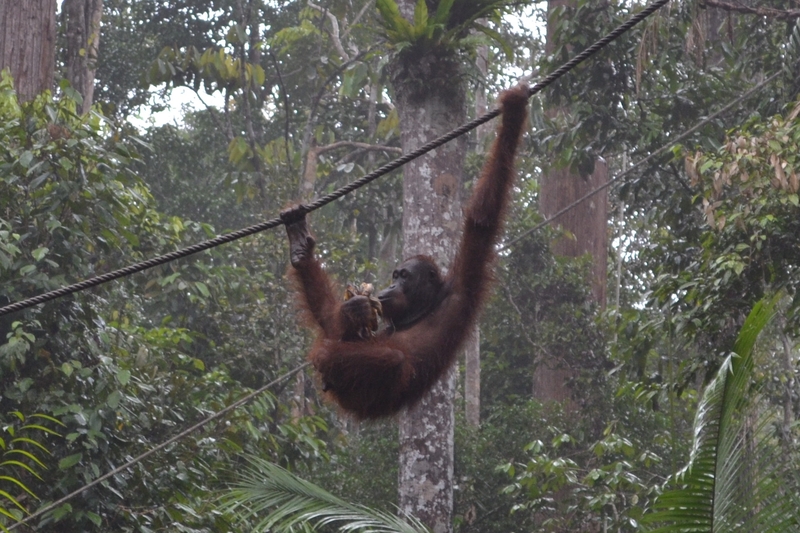 The children particularly enjoyed the funny antics of the young orangutans in the outdoor nursery where you can watch them from behind a glass screen. Here orphaned animals are taught to climb, swing and socialise and sometimes older orangutans that have been released will show up to join in the fun. At feeding time we saw a pregnant female, who came down in the tree right beside us and later we almost literally bumped into two young males by the walkway. We also spotted a venomous pit viper snake and our first wild hornbill. Brilliant! 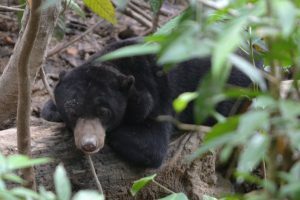 The Bornean sunbear is the smallest bear in the world and are an endangered species. Despite being protected they are still kept as pets or killed for use in medicines in China and Vietnam. The sanctuary opened to rescue and rehabilitate the bears as well as to raise awareness of their plight. We saw four of these adorable bears climbing trees and sun bathing. The last leg of our Bornean adventure was spent at Kinabatangan Nature Lodge. A two-night package which included four river safaris, two night hikes, a jungle trek, food, soft drinks and transfers for the grand total of $440. Unbelievable value! Apart from having to share our 6-bed dorm (private room was $300 extra) on the first night we somehow ended up separate from the rest of the guests for the tours, so we had private tours with our amazing eagle-eyed guide Mohammad. The Kinabatangan River is 560km long and fringed by the jungle. The unfortunate result of deforestation and loss of habitat means that wildlife are limited in their range so many live in the protected corridor area along the river. Mohammad grew up in the village by the river so has first-hand knowledge about life in the jungle. On our very muddy trek he described which plants would be used for medicine by the local people, how he survived a night lost in the jungle and pointed out different bugs and bird calls. During our river cruises we saw crocodiles, proboscis monkeys, silver leaf monkeys, macaques, monitor lizards, king fishers, eagles, huge flocks of hornbills (five of the eight different indigenous species), a big male orangutan (with cheek pads!) and just when we thought it could not get any better we we spotted a tarsier on our night hike – a tiny, nocturnal gremlin-like creature which Mohammed hasn’t seen in over a year. (And unfortunately James didn’t see it before it leaped away). Click here to see a small fraction of the numerous photos we took in Borneo.